The Senate budget also includes a $6.3 billion boost for public schools — about $4 billion of which would increase teachers’ and librarians’ annual salaries by $5,000, with $2.3 billion set aside for unspecified aid to school districts. And it orders the Texas Health and Human Services Commission to cut Medicaid expenses by nearly $1 billion, without identifying a way of doing so. 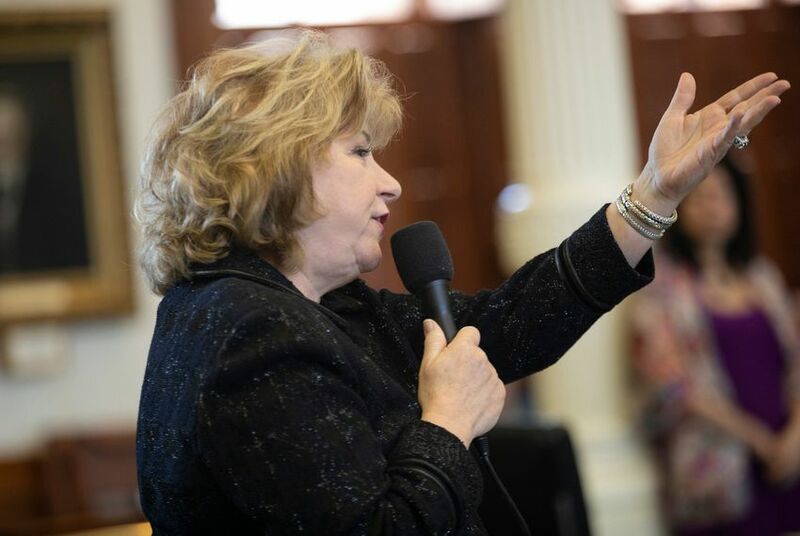 “We must take action this session to provide meaningful, lasting property tax relief,” said state Sen. Jane Nelson, a Flower Mound Republican and the Senate’s lead budget writer. The $2.7 billion in state funds set aside to pay for local property tax cuts “will conform to whatever solution for tax relief is agreed to this session,” she said. The Senate passed the two-year spending plan unanimously. The vote sets the stage for negotiations between the two chambers; the House unanimously approved its own version of a spending plan last month. Both chambers approved budgets with similar price tags, and both have agreed to pump an additional $9 billion in state funds into the public education portion of the budget. But crucial differences remain between the proposals favored by House Speaker Dennis Bonnen and Lt. Gov. Dan Patrick. The House backed a plan that would would lower school district tax rates statewide by 4 cents per $100 of taxable value, enough to reduce the annual property taxes paid by the owner of a $250,000 home by about $100. Texans in higher-tax school districts would see greater tax reductions under the proposal, with relief offered to both homeowners and business owners. The Senate, meanwhile, has offered up a host of property tax proposals that remain stalled at various stages of the legislative process. A bill by state Sen. Paul Bettencourt, R-Houston, would increase the state’s homestead exemption, pending approval by voters. It would shave off $10,000 from a homeowner’s taxable value, reducing annual school district taxes by roughly $100, depending on local tax rates. That bill was left pending in committee. Another Bettencourt proposal would force a school district to hold an election if it seeks to increase the tax rate by more than 2.5 percent from one year to the next. That bill, whose cost is still unknown, according to state officials, has not yet been heard in committee. While the Senate is aggressively pushing a proposal that would limit the growth of property tax revenues raised by cities and counties, it would have only minimal effects on the state budget compared with proposals that rein in school district taxes. That’s because the state shares a responsibility with local governments to pay for public schools. School district taxes make up the majority of total property tax revenues raised throughout Texas. Earlier Tuesday, Bonnen told a Lubbock talk-radio host there wasn’t much daylight between the two chambers on property taxes. Over roughly three hours, Senators touted a host of other priorities funded in their budget, including $230 million to maintain health benefits for retired teachers, $157 million to maintain graduate medical education opportunities for medical school graduates, and more than $1 billion across state agencies for cybersecurity and technological improvements. The Senate’s spending plan also contains a provision directing the Texas Health and Human Services Commission to cut costs by $900 million. If included in the final version signed by Gov. Greg Abbott, it would mark the sixth consecutive two-year budget to order the health commission to eke out savings from its operations. “We must continue looking for ways to have more efficient use of our limited resources,” she said. Emma Platoff, Aliyya Swaby and Shannon Najmabadi contributed to this report.